Vintage silhouettes with fun prints. 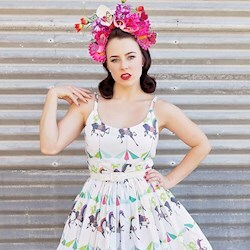 Sarsparilly is an Australian based women's clothing label that specialises in vintage inspired clothing with cute patterns and pop culture prints. Each dress is handmade to order so we can easily swap between styles and prints or source a print or fabric for you. We have everything from mermaids to Alice in Wonderland, Harry Potter to Dr Who prints. These dresses in classic cuts are perfect for Bridesmaid dresses or for Brides who want something different for themselves.